Summer, the most wonderful time of the year! Sun, weddings, graduations, cookouts, the beach, and the pool. What could be better? Below are some styling ideas for the best season of them all. Shirt dresses are a big trend this season and are perfect for the office. This J. Crew shirt dress is very slimming with the fuller skirt and a cinched waist. Take this classic up a notch with statement accessories. The pink earring and sandal will make you stand out. The tan structured tote is a professional and stylish accessory for the office. 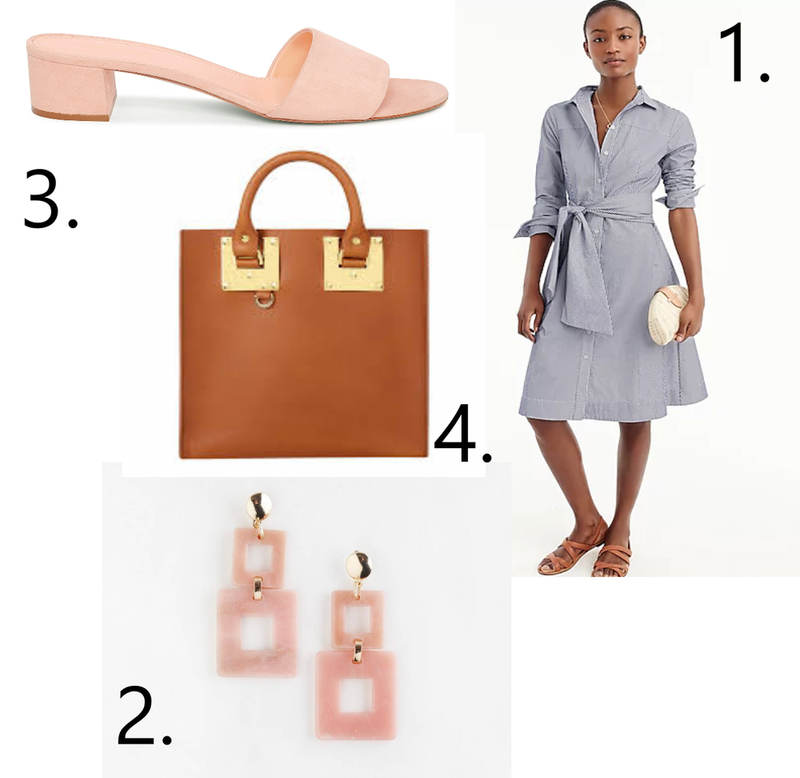 I love a chambray fabric and a paper bag waist. Both elements are shown in this Topshop short. One styling tip on shorts is to try buying a size up. A looser fit may have a more slimming effect. Wear these shorts with a tucked in a traditional white T-shirt from Hanes luxe label. It is a must-have item that you will wear all year long. The statement earring, suede slide, and crossbody bag all round out the look. If you have not figured it out yet, I am all about earrings! Nothing says summer like a white dress. I have paired it with an ecofriendly white statement hoop from Honey Rose & K, a straw tote, and a flat sandal. If you are going to spend $325 on a Mara Hoffman dress, you need to be able to wear it more than one way. This look is styled for a casual day out, but if you just changed the accessories it would be a great date night dress. If you are going to an event and you want to stand out and look super sophisticated, then you need a Self-Portrait top. Everyone else will be wearing last year’s off the shoulder top (YAWN) and you will look so stylish. If you have not heard of Self-Portrait, then you really must check them out! The top is an investment, so I kept the rest of the outfit budget friendly. If you are going to wear such a statement item, you need to keep the rest of the look super simple. Black jeans, black studs, simple black clutch, and an ankle strap heel. The jeans are Gap for Good, which is an eco-friendly jean that uses less water during the manufacturing process. I really love that!